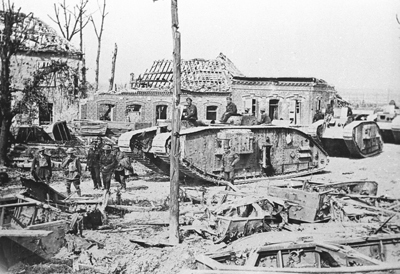 The Mark V* tank was created for one purpose – its extra length. 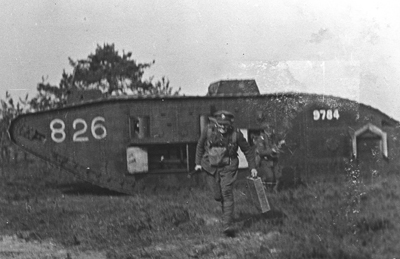 For all its advances and improvements over the Mark IV, the new Mark V tank that began to enter British service in the late Spring of 1918 had one similarity. At 26 feet 5 inches or 8.06m, it wasn’t any longer than the Mark IV, which meant its trench crossing ability was no better. The maximum width it could cross was still 10ft (3m). 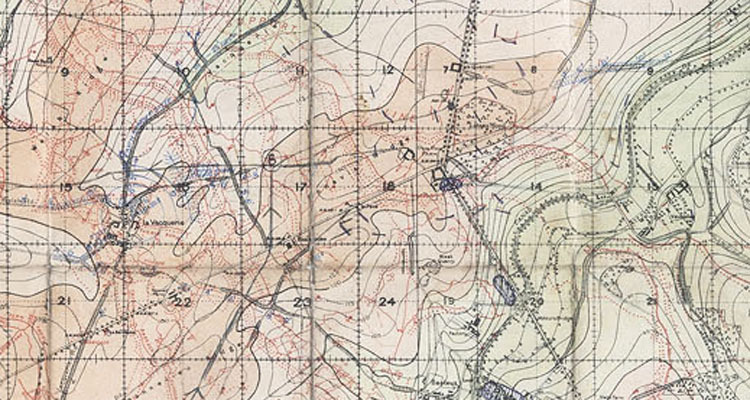 The Germans had soon worked this out and began building wider trenches to restrict the tank’s movements or trap any that tried to cross. Infantrymen dismounting, no doubt to their great relief. An early solution to this problem was the fascine, a large bundle of wood that tank crews could drop into a trench and use as a bridge. The downsides were that they required a huge amount of work to prepare and fit to the tank, each vehicle could only carry one, they weren’t reusable and they weighed 1½ tonnes, which strained the tank’s drivetrain and further reduced reliability. They were used at Cambrai in November 1917, but not again. During the Hundred Days Offensive the Tank Corps used cribs. A frame of timber and steel, these served the same purpose as the fascine, but was much lighter. They could still only be used once (although in theory they could be retrieved after a battle and reused later). Something else was needed, ideally something integral to the tank. 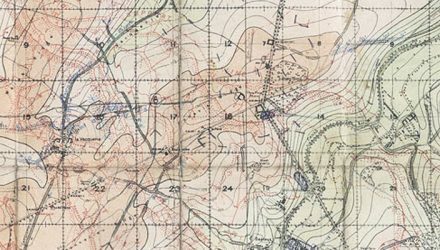 In mid-1917 Tank Corps headquarters recognised this need and began looking into the possibility of building a longer tank. A Male Mark V* of the 15th Battalion. The first solution was the Tadpole Tail, an add-on extension to the standard Mark IV. This made the tank 9ft (2.74m) longer, but it turned out to be unsuitable for use in combat as the tail wasn’t rigid enough for hard use. A better, if more complicated solution was to extend the tank from the middle. As an experiment a Mark IV was cut in half and fitted with a 6ft (1.82m) extension. This proved successful, so the design of the new Mark V was modified in a similar way. The Mark V* was the result. (The star denotes a modification to an existing design). At 32 foot 5 inches or 9.89m it was 6ft longer than the standard Mark V, and was 4 tons heavier at 33. Crew, armour, armament and engine power remained unchanged. However the new tank could cross a 13ft (4m) trench. The extra length allowed a door to be added on each side just behind the sponson. This was in addition to the existing sponson doors, so the crew had a better chance of escape. More ball mountings for Hotchkiss machine guns were added. There was normally one above each of these new doors and two in the modified rear cab. Instead of vertical front and rear plates, this now had sloping ones with an MG mounting in each. The new doors and the internal space allowed for the possibility of using tanks to carry machine gun crews forward. 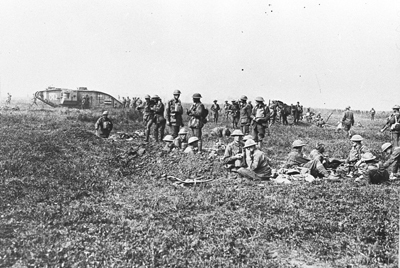 The idea was that they could dismount and set up their guns in newly captured trenches to help the infantry resist any German counter attacks. Riding in the tanks meant they could keep up with the infantry despite the weight of their guns and ammunition. Experiments suggested that up to 15 men and 4 machine guns could be carried. In reality this was true, but conditions inside the tank meant they were near enough incapacitated when they got out. 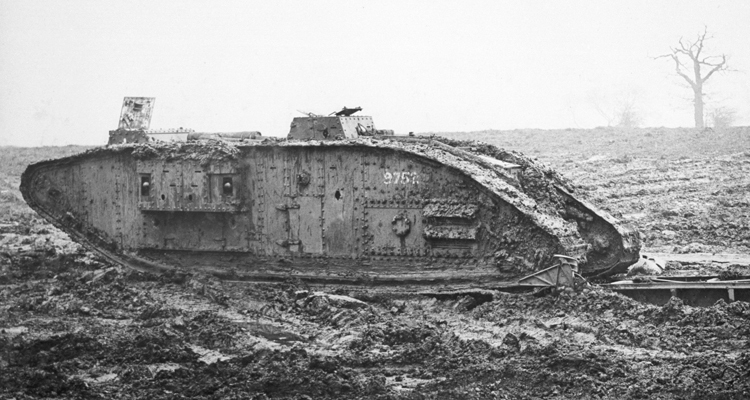 Unlike the experimental Mark IV, the Mark V* wasn’t produced by converting existing tanks. They were all built from new by the Metropolitan Carriage, Wagon and Finance Company in Birmingham. 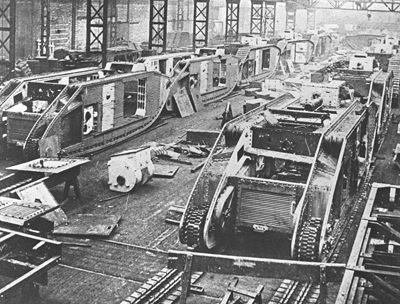 In fact more Mark V*s were built than Mark Vs. Of an order for 700 (500 Male, 200 Female) 645 were completed, as against 400 Mark Vs.
Mark V*s under construction at Metropolitan. Another modification that was applied to both the Mark V* and some Mark Vs was a new, wider track. The previous 20 ½ inch (520mm) plates were replaced with 26 ½ inch (673mm) plates. This spread the tank’s weight and reduced its ground pressure. They were fitted to most Mark V*s and some Mark Vs. The Mark V* will have benefitted most, as being heavier but with the same 150hp engine it had a lower power-to weight ratio. On top of this, its extra length made it harder to steer. Amongst First World War tanks the Mark V* is perhaps unfairly overlooked, overshadowed by the more common Mark IV and dismissed as a derivative of the mechanically innovative Mark V. One reason could be that only one has survived, at the US National Armor and Cavalry Museum, as opposed to 7 standard Mark Vs. However it was designed for a specific battlefield need, and it met that need well. Find out more about the Mark V in David Fletcher’s Tank Chat and the Mark V** here. Find out more about First World War tanks and beyond in the books below.